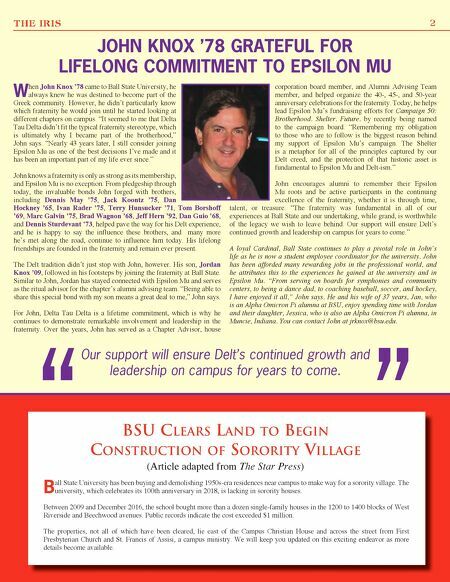 2 THE IRIS JOHN KNOX '78 GRATEFUL FOR LIFELONG COMMITMENT TO EPSILON MU W hen John Knox '78 came to Ball State University, he always knew he was destined to become part of the Greek community. However, he didn't particularly know which fraternity he would join until he started looking at different chapters on campus. "It seemed to me that Delta Tau Delta didn't fit the typical fraternity stereotype, which is ultimately why I became part of the brotherhood," John says. "Nearly 43 years later, I still consider joining Epsilon Mu as one of the best decisions I've made and it has been an important part of my life ever since." John knows a fraternity is only as strong as its membership, and Epsilon Mu is no exception. From pledgeship through today, the invaluable bonds John forged with brothers, including Dennis May '75, Jack Koontz '75, Dan Hockney '65, Ivan Rader '75, Terry Hunsucker '71, Tom Borshoff '69, Marc Galvin '75, Brad Wagnon '68, Jeff Hern '92, Dan Guio '68, and Dennis Sturdevant '73, helped pave the way for his Delt experience, and he is happy to say the influence these brothers, and many more he's met along the road, continue to influence him today. His lifelong friendships are founded in the fraternity and remain ever present. The Delt tradition didn't just stop with John, however. His son, Jordan Knox '09, followed in his footsteps by joining the fraternity at Ball State. Similar to John, Jordan has stayed connected with Epsilon Mu and serves as the ritual advisor for the chapter's alumni advising team. "Being able to share this special bond with my son means a great deal to me," John says. For John, Delta Tau Delta is a lifetime commitment, which is why he continues to demonstrate remarkable involvement and leadership in the fraternity. Over the years, John has served as a Chapter Advisor, house corporation board member, and Alumni Advising Team member, and helped organize the 40-, 45-, and 50-year anniversary celebrations for the fraternity. Today, he helps lead Epsilon Mu's fundraising efforts for Campaign 50: Brotherhood. Shelter. Future. by recently being named to the campaign board. 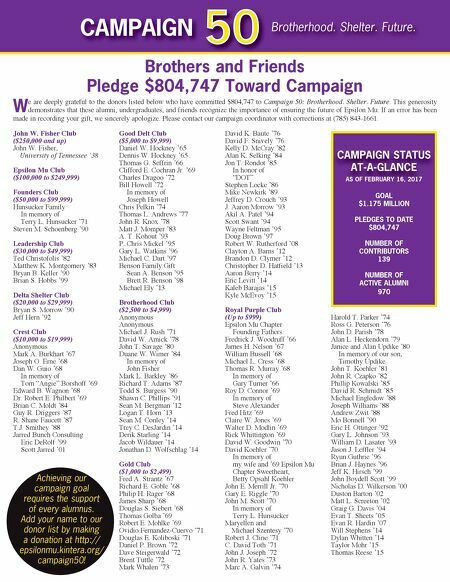 "Remembering my obligation to those who are to follow is the biggest reason behind my support of Epsilon Mu's campaign. The Shelter is a metaphor for all of the principles captured by our Delt creed, and the protection of that historic asset is fundamental to Epsilon Mu and Delt-ism." John encourages alumni to remember their Epsilon Mu roots and be active participants in the continuing excellence of the fraternity, whether it is through time, talent, or treasure. "The fraternity was fundamental in all of our experiences at Ball State and our undertaking, while grand, is worthwhile of the legacy we wish to leave behind. Our support will ensure Delt's continued growth and leadership on campus for years to come." A loyal Cardinal, Ball State continues to play a pivotal role in John's life as he is now a student employee coordinator for the university. John has been afforded many rewarding jobs in the professional world, and he attributes this to the experiences he gained at the university and in Epsilon Mu. "From serving on boards for symphonies and community centers, to being a dance dad, to coaching baseball, soccer, and hockey, I have enjoyed it all," John says. He and his wife of 37 years, Jan, who is an Alpha Omicron Pi alumna at BSU, enjoy spending time with Jordan and their daughter, Jessica, who is also an Alpha Omicron Pi alumna, in Muncie, Indiana. You can contact John at jrknox@bsu.edu. Our support will ensure Delt's continued growth and leadership on campus for years to come. BSU ClearS land to Begin ConStrUCtion of Sorority Village (Article adapted from The Star Press) B all State University has been buying and demolishing 1950s-era residences near campus to make way for a sorority village. The university, which celebrates its 100th anniversary in 2018, is lacking in sorority houses. Between 2009 and December 2016, the school bought more than a dozen single-family houses in the 1200 to 1400 blocks of West Riverside and Beechwood avenues. Public records indicate the cost exceeded $1 million. The properties, not all of which have been cleared, lie east of the Campus Christian House and across the street from First Presbyterian Church and St. Francis of Assisi, a campus ministry. We will keep you updated on this exciting endeavor as more details become available.